They’re especially tough for singers and narrators, of which I am both. But thanks to inhalers, cough drops and other remedies, I’ve started narration for “Dead Air,” book #2 in my “Behind the Mic” mystery series. Fortunately, my late husband, Geoff Hancock, set up an audio recording studio originally for my son in his room in our Chandler house. It was complete with sound baffling foam on the walls, and for fun, even a “RECORDING” sign with light outside and above his door. Then, before he passed away four years ago, he set it up for me to do book narrations, originally for other people. I know he’d be pleased I’m using it to narrate my own crime fiction novels. 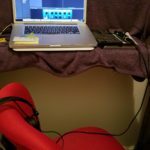 So, while I’m in and out of town this summer, and spending some cooler times in the cooler climes of Prescott, where I have a co ndo, I set up my audio recording studio in an empty walk-in closet in the guest bedroom. I brought my Mac computer with Garageband, which I use to record my voice. I have a high-end AKG mic Geoff bought specifically for vocals, along with a mic sound shield and pop filter. Insert an audio interface between the mic and computer, a few blankets to deaden the sound in the small room, and voila, I have a recording studio. 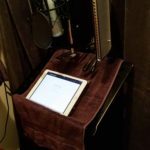 All my projects go thru ACX.com, owned by Amazon, and for those of you with good voices who are thinking about getting into the audio narration business, it’s easier than you think. ACX also have many tutorials and tips on how to set up your studio, even what to wear while you are recording, how to edit and master, etc. And there are thousands of titles from authors who are looking for narrators. So, I’m hoping to bang out the 18 of 20 chapters remaining over this next week before I head to NYC to work the IMTA convention. The narration took a higher priority than writing Book #3, Bleeder, because my son is off from school for the summer, and he is able to do all the editing and mastering before he goes back to SCC in audio production this fall. That’s when my travels will be over for the most part, and I’ll settle into a regular schedule for writing Bleeder.